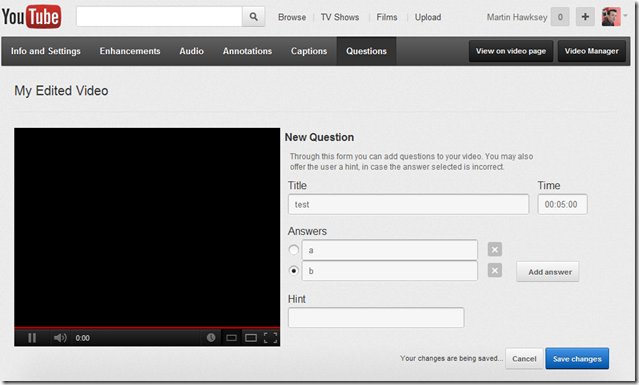 This is an opt-in beta for a simple Video Questions Editor on YouTube. Through this editor you can setup multiple questions to be displayed on top of your video during playback that a viewer can answer. The editor itself can be found on the video edit page, on the edit bar. After you have added several questions and the users have viewed them, you can see a summary of the interaction your users had with them through the analytics page, within the Annotations section. The feature represents work in progress, there is no plan for long-term support of the feature and may be removed at any time without prior notification. Your comments will help us improve and perfect the mixtures we’re working on. So jump in, play around and send your feedback directly to the brains behind the scenes. The page also includes a link to opt-in to the beta. Unfortunately when I click on save it hangs on ‘Your changes are being saved…’. It’s a shame that this feature doesn’t work yet. It’s interesting to put this development into the context of Google’s recent open source release of Course Builder, which was used as the technology behind their Power Searching with Google online course (xMOOC). So is Google trying to rock the boat in the mass online education market?